This beautiful Promontory Plan 3 is located on one of Carmel Valley's most coveted cul-de-sac streets. This functional family floor plan features 5 BR's (including one on the first floor with ensuite BA) & 4.5 Baths. As soon as you enter you are greeted with gorgeous wide plank hardwood flooring and vaulted ceiling. Enjoy cooking in your completely remodeled kitchen w/ quartz countertops, marble backsplash and custom built pantry. This private backyard has all you need for entertaining! Pride of ownership, This beautiful Promontory Plan 3 is located on one of Carmel Valley's most coveted cul-de-sac streets. This functional family floor plan features 5 bedrooms (including one on the first floor) and 4.5 bathrooms. As soon as you enter you are greeted with gorgeous wide plank hardwood floors and vaulted ceilings. The entire home is airy and bright with an abundance of natural light. Enjoy cooking in this completely remodeled kitchen featuring Thermador appliances, KitchenAid refrigerator, quartz countertops, marble backsplash, custom built pantry and sleek ceramic tile flooring from Spain. This private backyard has all you need for entertaining including a fire pit, outdoor dining area and huge lawn. The master bedroom boasts vaulted ceilings and its own enclosed retreat which can be used as the perfect private office. This bright master bathroom has a steam shower, jacuzzi tub and walk-in closets with custom built-in shelves and storage. The best location in Carmel Valley, this neighborhood is minutes away from San Diego's best schools, shopping, and beaches. 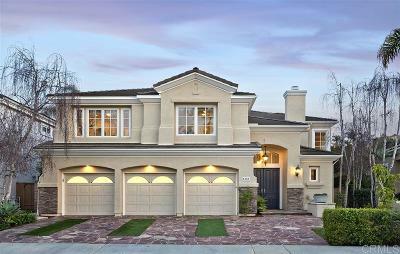 Within the award winning Solana Beach School District for elementary and San Dieguito Union High School District, this home is an easy drive to the best public and private schools San Diego has to offer.